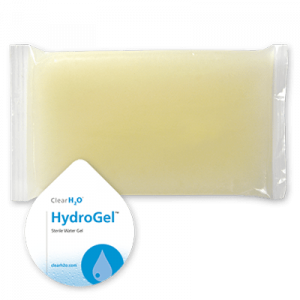 HydroGel® is a non-wetting, sterile water gel for animal hydration. 98% pure water. The industry standard for hydration during transportation. Purified Water, Hydrocolloids, Food Acid, Electrolyte Mix. 24 month shelf life. Does not require refrigeration or special handling. Animal transport – clean, dry, and single use. What does Barrier Packed mean? Barrier Packed products contain cups or pouches inside of a medical grade Tyvek bag. This saves labor by eliminating the need to wash individual cups or pouches when transferring into a clean room or biosecurity facility. Why are gel products a good choice for research animals? Unlike water bottles and mash diets, gels provide a consistent amount of hydration, nutrition and medication without wetting the animal. While particularly useful when transporting animals, HydroGel, is also a great choice for recovering animals and special needs animals who require consistent, easy-to-consume hydration support. How much HydroGel do I need to supply for an animal during shipment? The amount of HydroGel required is dependent on the species of animal, the number of days in transit, and the number of animals. Daily water consumption differs by animal. Please note many factors such as ambient temperature, animal weight and environmental conditions impact the daily water consumption. The suggested values listed below are average daily water consumption guidelines for frequently shipped animals. HydroGel® is 98% pure water; therefore, the gel consumption is equivalent to water consumption. 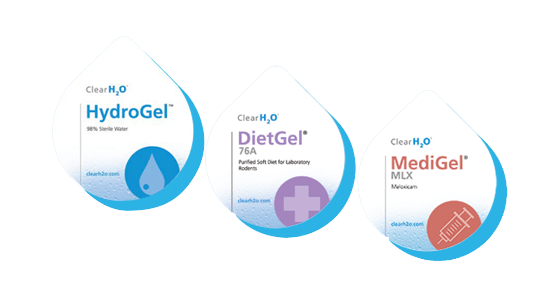 What is the best way to store HydroGel products? Unopened HydroGel can be stored at room temperature and does not require special handling. Shelf life for unopened HydroGel is 24 months from date of manufacture. Once opened (provided the gel has not been contaminated) ClearH2O products can be stored either at room temperature or at 4°C in a sealed bag/container to prevent the product from drying out for approximately 2 weeks.